Christmas dog treats made by you! What pet parent wouldn't be delighted to receive such a heartfelt dog gift! 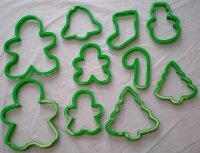 Use the various Christmas cookie cutters as shown in the image above, or use simple dog bone or paw shaped molds for an overall dog theme. To decorate these holiday dog treats, we used Fido's Frosting brand Royal Icing for Dogs made by K9Cakery.com, the online dog bakery supplies company. The yogurt icing dries hard and shiny and will not melt. It does not need refrigeration so these treats could even be shipped through the hectic holiday mail without worry of them melting and falling apart. We chose dark green and red coloring, and used the icing's white color as well. you can see that it dries a shiny white. Red is perfectly safe to use. The current food colorings that are available have been modified and no longer use red dye # 2 that was the topic of concern in the past. It is best to use the powdered colorings with this dog icing. One more word about the red color. It can be a difficult color. There is even some red coloring that has an "aftertaste." However, for dogs, this will not be an issue - trust us! The red may require several coats to get a vivid look. It tends to dry on the dull side. However, when used with the Fido's Royal Icing for Dogs, it will have a sheen and be more vivid. Package your finished treats with a dog-themed look. We used the foil dog bone cake pan with lid from K9Cakery.com. We covered the pan with a piece of red tissue paper to make a colorful background, and then arranged the dog treats in the pan. The foil pan can be reused by the gift recipient to bake a dog cake, so essentially they are receiving two gifts in one! It makes a wonderful treat box because it does come with a lid, and you can view the treats inside. This is also a terrific display idea for anyone who wants to sell their own dog treats already packaged for Christmas!